Alright kids, I’m truly disgusted and impressed with this recipe. And I cannot take credit for any part of this. Two of my hysterically fun cubemates created this one specifically for White Trash Wednesday. add all to a shaker with ice. shake well and strain into a mason jar. Then, drink… While wearing jean shorts and wifebeater. In honor of the fact that I’m at the beach, today’s white trash recipe is Summer Brew. 4 beers: preferably something light…corona, blue moon, keystone, natty light. Fill the can with vodka. Pour into pitcher. Stir to melt the limeade. Add the beers. And if you’re feeling a little classy, throw some sliced limes into the pitcher. Pour into a plastic solo cup over ice. Garnish with lime slices and have a seat and enjoy! Now if you’ll excuse me, I’m heading down to the pool. i mentioned a week or so ago that i was partaking in a weekly photo challenge. this week’s challenge was “cocktail”. i was lucky enough to have friends that will share in my photo adventures, so i dragged them to a lovely fancy bar just to get “the shot”. the martini above was one of many and not even the one i selected for the challenge. of course i only just doctored up the photo above a few hours ago so it didn’t look that appealing before. 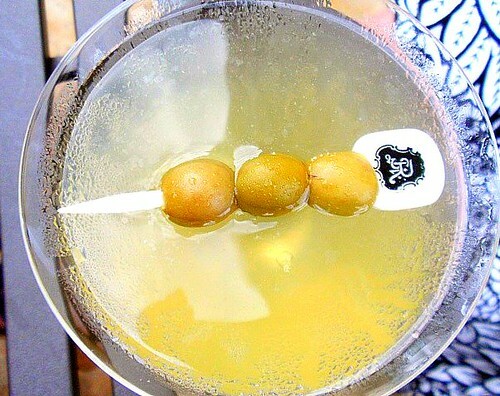 because let’s be honest, martinis are good. and dirty martinis are best. Only a tad bit early. I know, I’m a posting machine today, but that’s only because I may be out of commission for a while. If this jury duty actually happens, I may lose all of my creative juices. The dankness that is downtown Atlanta may wipe my creativity clean. Lord help me. Today’s white trash wednesday recipe comes in a liquid form. Are you sitting down for this….you might want to. Okay maybe not now, but I have a feeling that after you’ve had this drink you’ll need to. Combine all ingredients and stir until everything is dissolved. Freeze overnight. Mix ¾ cup slush with ¼ cup 7-Up or Sprite.